When you run a ASP.NET Core application using dotnet run CLI command, the application is started for you and made available at a specific URL and port. During development stage it's very common to make changes to C# code such as models, controllers, and other classes. To see these modifications in action you need to stop the application and again execute the dotnet run CLI command. Wouldn't it be nice if there is some way to detect such code changes and re-start the application automatically? Luckily, there is a tool called file watcher that does the trick. Let's see how. The dotnet file watcher tool detects changes to your source code and re-starts your application. You can also use this tool to automatically run the tests. For ASP.NET Core 2.0 the file watcher tool is available as a NuGet package. For ASP.NET Core 2.1 it's included in the .NET Core SDK itself. In this article I am going to use ASP.NET Core 2.0. So, I will add the required NuGet package in my application. Before we do that let's quickly see the usage of the filewatcher tool. 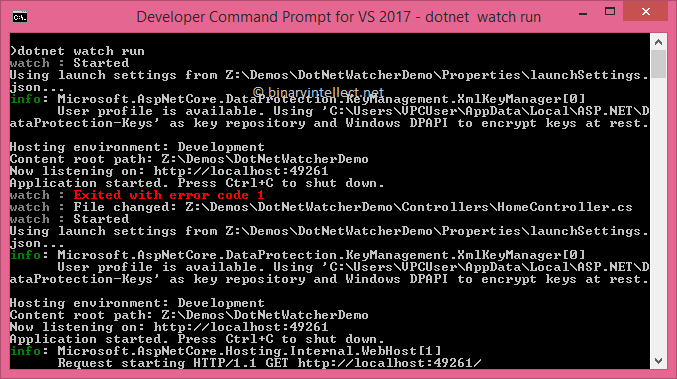 As you can see you simply added "watch" command to "dotnet run". The application primarily consists of a model class called Employee, a controller named HomeController, and a view named Index.cshtml. The Employee class contains four public properties - EmployeeID, FirstName, LastName, and Country. As you can see, the Index() action simply assigns some values to various properties of Employee and passes it to the View() method. 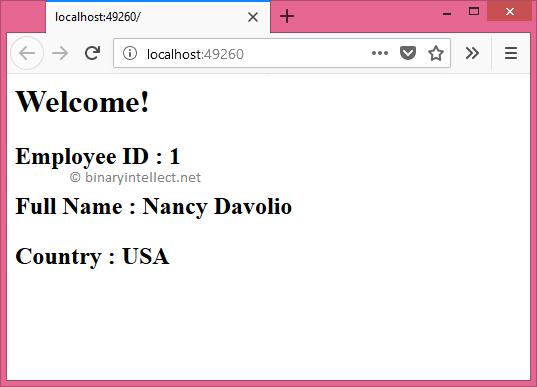 If you open a browser and navigate to the URL shown by the dotnet run command, you will get the output as shown earlier in this article. The above code changes the Country property from USA to UK. Refresh the browser window. You won't see the changed property value on the page. This confirms that the changes made to the code after running the application will call for restarting the application. Now stop the application by pressing Ctrl + C in the console window. Open the browser again and navigate to the URL as before. You will get output as shown at the beginning of this discussion. If you observe the logs, you will find that the changes to HomeController.cs have been automatically detected and the application has been restarted. If you refresh the browser window you will see the modified Country value displayed on the page. In the preceding example, we ran the application from the console. 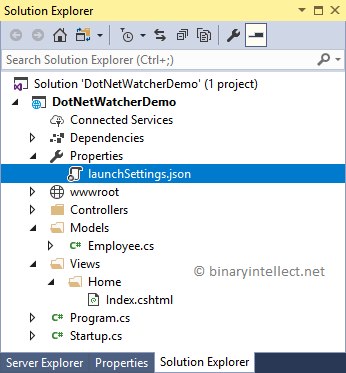 What it you want to utilize the features of the file watcher from within Visual Studio? You can do that with the help of launchSettings.json file. Let's see how. Notice that under the Properties node you have a JSON file - launchSettings.json. This file contains certain settings that decide how the application is started. Visual Studio looks at these settings when you press F5 or Ctrl + F5. Here, we are adding a new launch profile whose name is - Run using dotnet-watch. 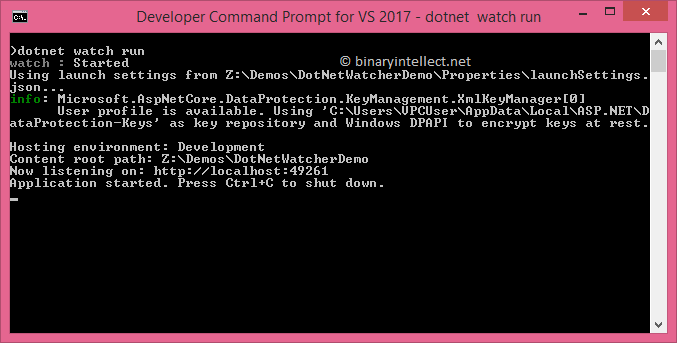 The commandName is set to Executable because we want to invoke dotnet command line tool. executablePath is set to the path of dotnet.exe. The working directory is project's folder and commandLineArgs is set to watch run. Carefully add the above launch profile and save launchSettings.json file. Make sure that you select the newly created launch profile. Ok. Now run the application by pressing Ctrl + F5 (because we want to change the controller from the VS itself). 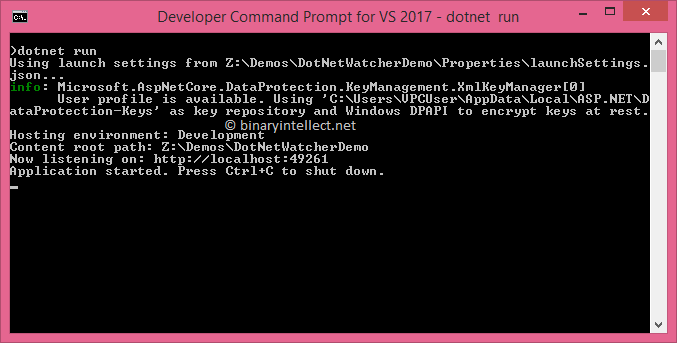 You will also find a console window being opened that shows the logs of the dotnet-watch command. Open a browser and navigate to the web page as before. You can now change the Index() action by opening HomeController in the Visual Studio IDE and observe the console window for the logs as before. To know more about the .NET file watcher tool go here.